On the 15th (Mon), examine the collection at National Air and Space Museum and then explore the activities along Tidal Basin. 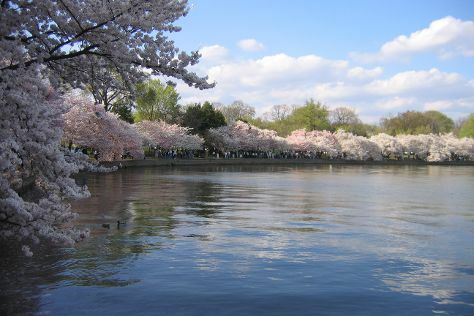 To find other places to visit, more things to do, maps, and more tourist information, use the Washington DC vacation builder . The Route module can give you travel options from your home to Washington DC. In April, daily temperatures in Washington DC can reach 68°F, while at night they dip to 49°F. Cap off your sightseeing on the 15th (Mon) early enough to travel to New York City. On the 16th (Tue), pause for some photo ops at 9/11 Memorial and then take in the pleasant sights at Central Park. On the 17th (Wed), you'll have a packed day of sightseeing: explore the galleries of The Metropolitan Museum of Art, examine the collection at New York Public Library, and then admire the striking features of Empire State Building. For where to stay, photos, more things to do, and more tourist information, read our New York City online visit planner . Fly from Washington DC to New York City in 3.5 hours. Alternatively, you can take a train; or drive. When traveling from Washington DC in April, plan for slightly colder days in New York City, with highs around 61°F, while nights are about the same with lows around 45°F. Wrap up your sightseeing on the 17th (Wed) to allow time to travel back home.